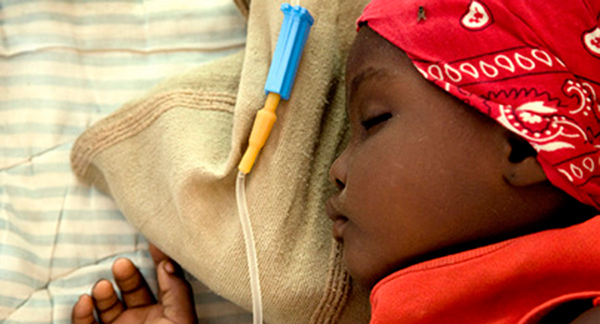 A cholera infected child resting on the floor of the Doin medical center near Saint Marc, Haiti. We’re making much-needed progress in the global fight against cholera, which kills 95,000 people each year, writes Dr. David A. Sack of the Johns Hopkins University School of Medicine and the Johns Hopkins Bloomberg School of Public Health. Supplies of the cholera vaccine will soon triple—thanks to a new, WHO-sanctioned manufacturer—allowing health workers to deploy it preventively in high-risk hotspots, rather than solely in response to outbreaks. Sack also says health workers are refining best practices for administering the vaccine, which should increase efficacy. These advancements, Sack warns, do not nullify the need for further vaccine innovation, nor for improved water and sanitation infrastructure. Basic cancer-fighting measures—for as little as $1.72 per person—could save hundreds of thousands of lives in poor countries, according to research published yesterday in The Lancet. Nearly 800,000 women die of cervical and breast cancer every year. 2/3 of breast cancer deaths, and 9 out of 10 cervical cancer deaths occur in developing countries. Vaccinating girls in poor countries against human papilloma virus (HPV) over 4 years could prevent 600,000 cervical cancer deaths. In a public hospital in Arusha, Tanzania, physician Anna Budde witnessed an appendicitis patient writhing in pain for 6 days until the city’s lone anesthesiologist was available for surgery. Budde underscores an astonishing statistic: 5 billion people lack access to safe and affordable surgery and anesthesia, according to an April 2015 Lancet Commission on Global Surgery report. Budde says operating space and equipment are all well and good, but they aren’t worth much without skilled professionals to use them. Global efforts, she believes, should focus on training more surgeons and anesthesiologists. Related: Don't miss today's symposium, Operation Health: Surgery’s Emerging Role in Global Health, co-hosted by the Johns Hopkins Bloomberg School of Public Health and the Pulitzer Center on Crisis Reporting, set to explore surgery’s place in global health. The kicker? Women have dealt with the same side effects, and worse, for decades with female contraceptives. In a detailed comparison, Julie Beck concludes that women have been willing to weather the side effects because the stakes are much higher with unwanted pregnancies. But she adds that even with the side effects, most of the men in the study (more than 80%) wanted to continue using the injectable birth control—indicating a willingness to share more of the responsibility for birth control. In the US, the dominant health message on e-cigs is that vaping is dangerous and could be the first step to developing an addiction to smoking, especially for young people. Amid slumpling sales of e-cigs, however, some public health officials are expressing concerns that the consistent warnings about e-cig dangers is a disservice to smokers who might benefit from the devices to help them quit smoking. Cleaner, more efficient and affordable indoor cookstoves may help safeguard the health of 3 billion of the world’s poorest people. If adopted, these improved cookstoves could replace open-fire cooking, which is often fueled by wood, dung, charcoal or crop waste, and contributes to air pollution and climate change. Recently, US companies BURN, Envirofit and Biolite have garnered massive funding from global investors to design high-quality stoves at low prices. Still, the new cookstoves might remain out of reach for some of the world’s most impoverished. The best solution continues to be providing access to electricity and natural gas. Please join us for a celebration of D.A. Henderson’s life. Speakers will remember D.A.’s extraordinary leadership of the global smallpox eradication effort and his many other contributions to public health that will benefit us for generations to come. More Children Are Being Poisoned By Prescription Opioids – NPR Shots Thanks for the tip, Tarun Bhatnagar! Global Health NOW is an initiative of the Johns Hopkins Bloomberg School of Public Health. Views and opinions expressed in this email do not necessarily reflect those of the Bloomberg School. Contributors include Brian W. Simpson, MPH, Dayna Kerecman Myers, Lindsay Smith Rogers, and Jackie Powder. Write us: bsimpso1@jhu.edu and follow us on Twitter @GHN_News.